DebuffVitals is a tool to provide help tracking debuffs and boss states during raids. This copies DTox's Vitals functionality and extends it to include effects. A huge thanks to DTox for his work! 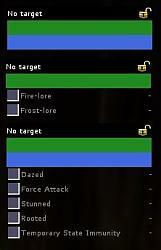 2) Select a previously locked target - click anywhere in the morale/power/effects area. 4) Remove a tracking frame - right click the title bar and select remove target. If a frame is locked, it cannot be removed. 7) target mobs and try it out! 1) IMPORTANT: Sometimes, applied effects don't show up in DebuffVitals, especially single effects or initial effects. This is an issue with Lotro's Lua interfaces. I repeat. This is an issue with Lotro's Lua interfaces. This is because the list of effects from SSG's Lua interface is often partial and occasionally duplicated. Changing away and back to the target usually helps. Applying more effects usually helps. This operates surprisingly well in fellowships or raids. If you want this to improve, please submit bugs to SSG and talk about it on https://www.lotro.com/forums/forumdi...amp-Discussion. 2) Morale, power, new effects, and corruption counts do not update unless it is targeted by yourself or fellowship member. Lotro's Lua interfaces are intentionally limited to what a client reasonably knows. This means active information about one target and one target only. 3) Toggle effects will not disappear when a target goes through some transition or similar situation, eg, a target dummy resetting or boss phase, or a character changing trait trees and resetting marks. Refreshing the target helps. 4) "Stunned" effect occasionally persists after timing down. Refreshing the target helps. 1) If an error indicates a problem with loading configuration, delete the DebuffVitals.plugindata file commonly located at ...\Documents\The Lord of the Rings Online\PluginData\<account ser>\<server>\<character>\ folder. ...ngs Online\Plugins\Grimmerthan\DebuffVitals\Main.lua:2 1: Failed to import package "Grimmerthan.DebuffVitals.EffectFrame". Message me here, Grimmerthan @ Brandywine, or @Grimmerthan#6871 @ Lotro Discord. Creepside version of this plugin would be greatly appreciated, tracking warg or spider debuffs or slows in a fight is invaluable. the chat starts without end spamming error 478. Spam happens exactly until you remove the lock. I think I've fixed this. I suspect this should have been seen before and wasn't reported, or my recent changes exposed something. Also, I noticed that the FPS starts to fall very strongly when monitoring only 5 debuffs of RK's (dots). This is a good example of the plugin trying to keep up with a lot of effect updates. I've been thinking about this for a bit, and I think that throttling should help this and still provide good effects tracking. 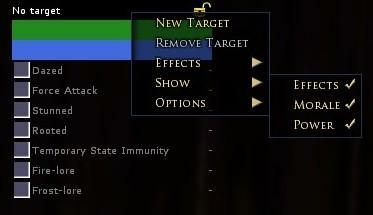 At least, until there are Lua changes from SSG that improve this part of Lotro's Lua interfaces. The image link didn't work, but that's fine as the issue was easily reproduced. Thanks a lot, Lisgrat! If you take someone to the target, block using the lock, and then click on any empty space on the screen, the chat starts without end spamming error 478. Spam happens exactly until you remove the lock. Sometimes a similar error spam and without a lock. Just in battle. Spam will stop if you change the target or update the current one. Plugin settings are the simplest: display only Morale. No effects are displayed, Power is also hidden. Also, I noticed that the FPS starts to fall very strongly when monitoring only 5 debuffs of RK's (dots). If the plugin is disabled and good old Vitals returns, there is no drawdown of the FPS. Last edited by Lisgrat : 02-18-2019 at 01:43 PM. Any chance we might be able to adjust font size? Ooh! Yah, good idea. I skipped it when I was duplicating m_vitals, and I should put it on the list now. - Is it possible to get an approximation for Standard of War e.g. a counter that counts towards 30 once the use of Standard gets logged in the combat log? Warden is the only one I'm not too familiar with, so no information about missing debuffs from me. For the other classes I should've gotten most if not all missing debuffs. 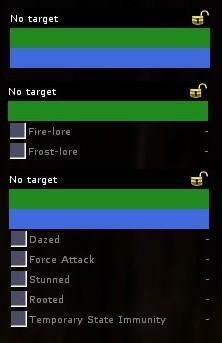 If you want to display most of them in the list you run into the problem of the list becoming massive: maybe you can opt for something like Buffmonitor does with hiding options behind a clickable frame, in this case a separate category if you will for each class, and effects sorted by debuff or dot. -- Yes, this is the Lua interface. It's buggy. I can't make it operate better. I keep saying this File a bug with SSG and post to Lotro forums about it? -- This is a buff and not an effect on an NPC. This is not yet part of what DebuffVitals does. When(/if) this is extended to include effects on PCs, then sure. It wouldn't track log output though. -- This is a problem with tracking toggled effects. Because of the buggy Lua response, DebuffVitals isn't able to tell the difference between "mark there but not in the returned list" and "no effect at all". This is handled by a timeout on toggled effects, and missing effects will disappear after a few seconds. -- I don't have a good answer for this. Let's see if some ideas or a direction becomes more clear after some more changes. Last edited by Myrthian : 12-05-2018 at 03:00 PM. When I use Barbed Arrow on my hunter, the debuff does not display. I have to untarget the mob, then target it again for it to show. edit: Just to add, if I use Pen Shot afterwards it shows. Yep, this is how the Lua interface works here. In this situation, the first time there's an effect, the bleed isn't in the list returned through Lua. The next time the list is returned, either by a target refresh or by an effect coming or going, the bleed is in the list. For solo play, where there are few effects coming and going, it won't shine. Take it into an instance though, and it handles far better. Last edited by Grimmerthan : 11-29-2018 at 10:25 AM. Looking good so far: I see you used my idea to hide health/power to make it similar to buffbars, but for dots/debuffs. - You're using the title bar to access the context menu which means there is no possibility to completely hide the bar itself to just display debuffs/dots? Would it be possible to minimize the bar + hide the name of the target? - Would it be possible to disable the names of the debuffs/dots and just display the icon with the timer, akin to buff monitor? - How about progress bars like buff monitor, maybe you can borrow the how-to from there? I'm unsure what the lock icon is supposed to do: I though it would be there to lock the frame, which isn't the case, and instead it's used for a target lock. What is the frame position used for? Quite possible. This would probably remove right-click context menu interaction with whatever is targeted, to expose the plugin's menu instead. Maybe I can put up a straw poll to get some wider feedback on some of these. I'll think about how to do that. Absolutely lots are missing. Please make sure these are actually effects on a target though, and not skills or buff. If you could screenshot the tooltip of the effect on the mob, this would be perfect. Yes, would be small effort. If another layout is also being requested, then not small effort. I've been thinking about progress bars and flashing. I may lift some more code from BuffBars (thanks a lot!) to speed this along. There's much more infrastructure in that code though, and I'd hope to keep it light, code-wise. Very feasible. I was thinking a CLI command to toggle visibility though, but you're talking about what StatWatch and Epic Battle Plugin have. It locks onto a target, so one can maintain an easy-click target to multiple different mobs. It saves the location of all frames, so when reloaded, the same count, positions, and effects come up. Another step towards making instance/boss/situation specific setups, where one saves and loads repeatable used setups. @Matsack : you're welcome, and thanks for your appreciation. I consider CA, BuffBars, and this plugin to be complimentary. Each do different and valuable things. Last edited by Tekko : 11-23-2018 at 04:25 PM. Last edited by Myrthian : 11-21-2018 at 02:53 PM. To be honest, i liked the plugin functions, but didn't install the plugin to test it when i wrote first post. Now i have, and sure it's doing, what CA and Buffbars have a hard time doing. GREAT WORK !! Haven't tried this out in raid, but sure work flawlessly in instances. I love the improvements you've been making, thank you! About "hiding inactive effects", I suggest it to be optional, because for debuffs the grey "inactive" skill is the reminder to refresh it! The plugin doesn't parse the combat log. Rather it looks at lists of effects currently applied to a target. This effect list is mostly broken but works enough of the time that this is still useful. Do you have any specific screen captures of the effects that aren't being shown (showing the tool tip from the effect on the mob)? When I find a bit of time from the new content, I'll take a look.